We’ve all heard that humpback whale songs have complex, repeating structures, and that the themes evolve over course of months and years. Yet listening to the gruts, guffaws, and groans of humpback recordings, it’s hard for most of us to really hear the large-scale structure that ties together these deeply alien sounds. 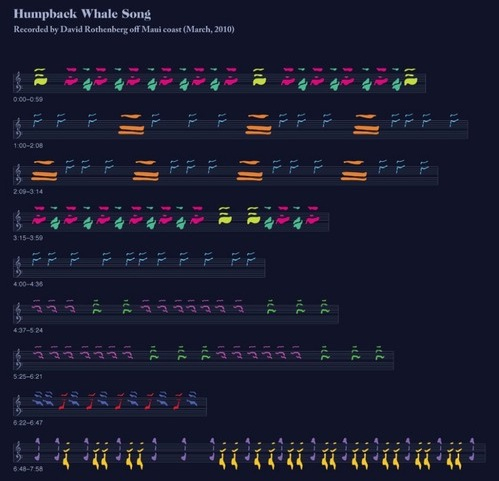 In an article recently published on Medium David Rothenberg and Mike Deal have built on work done back in the 1970s by Scott McVay, and created a visual representation for humpback songs that makes it all suddenly and delightfully clear. For starters, Deal created glyphs to represent particular “song units.” Each of these distinctive utterances is shown in a different color; the shapes mimic the shape of the sonogram of the sound. Following on McVay’s work with Roger and Katie Payne, Deal and Rothernberg show how these units are combined to create “phrases” lasting 20-40 seconds; several phrases create a “theme,” and a sequence of themes lasting 5-30 minutes is the “song.” Deal and Rothenberg take McVay’s work one step further by overlaying the units on an expanded musical staff to represent the frequqency of each phrase (each utterance of the whales includes a broad range of tones, like a chord with many audible overtones, so the glyphs stretch over a substantial span of the musical staff). As Rothenberg notes, “The pattern in the phrases starts to seem like an alien language. But even eerier is how much more human-like the order appears than most known animal vocal behaviors.” Go read the full article; it includes several videos of note, including one that animates the above notation while the 8-minute song is played, and one that explores the compelling similarities between humpback song and mockingbird songs. Also featured are many of the original notations done by McVay, which inspired this new take on it, and exceprts from a recent lecture by Katie Payne (see it here) that dives deep into the questions of cultural change and linguistics that are raised by the extraordinary nature of the these songs. Jim, thanks for sharing this. It looks like an exciting way to present sonograph data that makes patterns easy to discern.